Too often, American voters have a tendency to base their choices on emotion and “factors like the candidate’s appearance,” way of speaking and positions on moral issues, “rather than the policies they are proposing,” says co-founder Nikita Bier, a senior majoring in political economy and business administration. 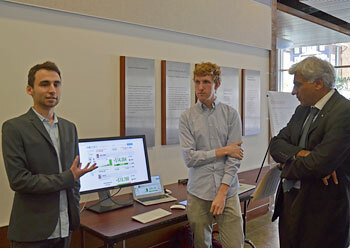 Launched in February, as the 2012 presidential election season gathered steam, the nonpartisan website has already generated more than 160,000 forecasts for users and attracted the attention of congressmen, representatives of both national parties and a high-ranking adviser on the Obama re-election team. The $10,000 second-place prize went to Pathologicode, a non-invasive technology for the early detection of diabetes. A project to develop a low-cost, sensor-rich pen to improve the handwriting of children with disabilities, Pika Pen, received the $7,000 prize for third place. 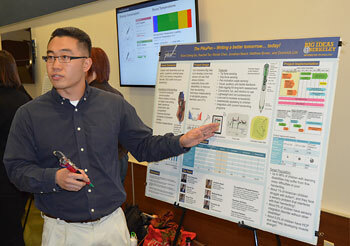 The Pika Pen proposal, pitched by Evan Chang-Siu, a graduate student in mechanical engineering, earned the third-place prize of $7,000. Big Ideas projects are having an impact around the world. Members of the general public and campus community can vote for their favorite project through the People’s Choice Video Contest, which offers a first-place prize of $10,000. People’s Choice voting closes April 20. The winning project will be announced April 23.